No more renders or rumors, it’s real and it’s coming. The years of rumors and speculation surrounding the upcoming mid-engined Corvette are all finally coming to an end, after General Motors announced that the very long-awaited C8 will be revealed in full production spec on July 18. The rumors of this particular car started almost half a decade ago but the idea of a mid-engined Corvette has been a topic of interest for far longer than that. With such a lot riding on this drastically different layout, some might forgive GM for keeping things under wraps for so long but as eventually happened with the perpetually teased new Supra, even the most ardent fans were starting to get a bit impatient. It is a good thing then that GM CEO Mary Barra finally made the announcement at a charity gala in New York last night. She arrived at the event in the new car with Corvette chief engineer Tadge Juechter. 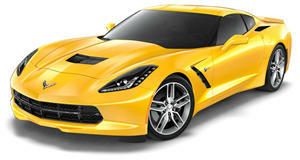 The C8 will be entering production in the latter part of the year and the first model will be the base Stingray. The engine will use a version of the existing pushrod 6.2-liter V8 making around 500 horsepower. A number of higher performing Z06 and ZR1 variants, as well as a range-topping hybrid, will follow, all expected to use a newly-developed 5.5-liter DOHC V8. It will have twin turbos in ZR1 trim with the hybrid adding an electric motor to power the front wheels and producing a rumored 1,000 hp with this setup. The pricing is expected to increase by just under 10 percent over the outgoing car, an impressive achievement considering all the new tech and development costs that have gone into the project. Less happily a seven-speed dual-clutch gearbox seems to be the only transmission choice for the C8. Chevrolet has added a next-generation Corvette page to its website and potential customers are encouraged to sign up to keep updated on the latest developments.